- Pick up one (F1) or two (F2) connection stitches at the edge of the previous row. - Insert the needle through the previous stitches, moving from right to left, "under 1" and "over 1". - Turn the needle towards 2 o'clock, and insert the needle "under 1" and "over 2"
- Pull the needle and yarn through, and tension a new loop either around your thumb (and then drop it off), or tension the new loop 'freely'. - There is one loop around your thumb, do not pick it up. - Pick up onto the needle one loop behind the thumb, from right to left. - Turn the needle towards the root of your thumb (8 o'clock), and push the needle under the thumb loop and the needle yarn (working yarn, which runs from your thumb to the needle). - Tension the loop around the needle smaller by pulling gently the yarn (or if your yarn is thick, or you wish your loops to be looser, pulling the stitches smaller may not be necessary). 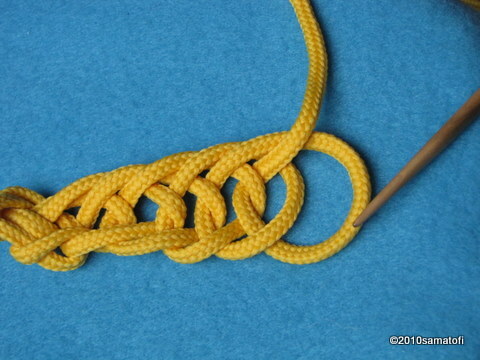 - Pull the needle and yarn through, and tension a new loop around the thumb. This stitch is a rather simple (only few loops are handled), but you can make even thick mittens if you choose a thick yarn. Though, with thick yarn also gaps between the stitches become a bit larger. When you are working with a thinner yarn, you can pull the latest loop smaller around the needle, like shown on the video, so that the stitches will become smaller and the fabric denser. In Finland this stitch has been used at least in Muurame (Korpilahti) before 1910 (Kaukonen, 1960) and in Savitaipale in 1930's and earlier (personal communication 9/2010). 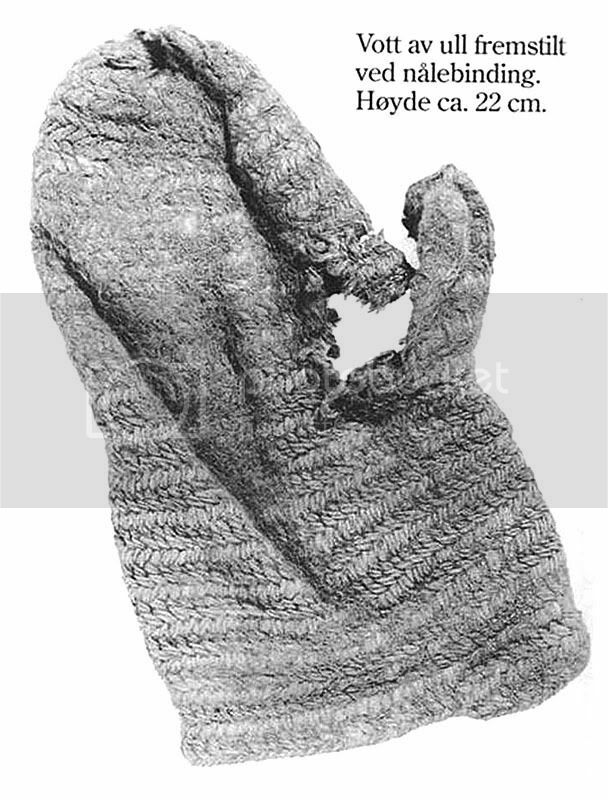 This stitch has been used also for milk sieves in Finland and in Sweden (Kaukonen, 1960). 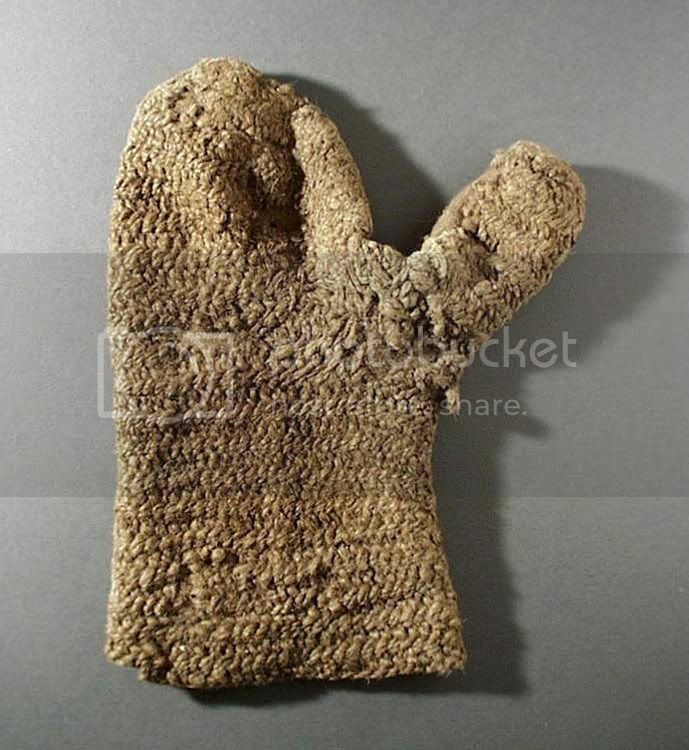 There are historical mittens made with this stitch type (Oslo Stitch) at least from Oslo (Norway) from the Middle Ages (photo), and from Lund (Sweden) from 14th-15th century (photo), and from Arnheiðarstaðir (Iceland) from 10th century (M. Hald) (photo; choose page 74 from the tab on the left).